2040 Partners for Health invite neighbors in Northwest Aurora, East Montclair, Stapleton and Park Hill to a Neighborhood Health Summit Saturday, Feb. 23. There will be speakers on heath disease, smoking, gun violence, diabetes and the Affordable Care Act. Admission and lunch are free. 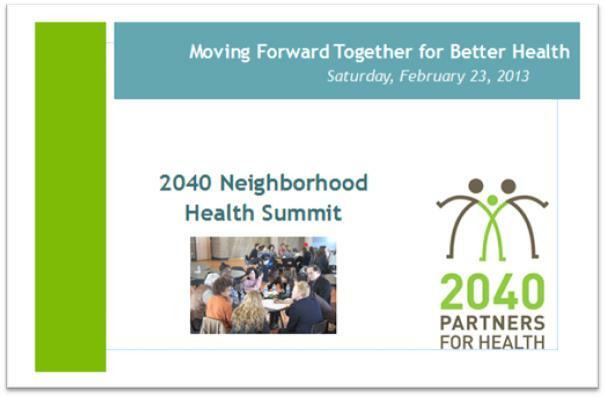 Please RSVP by Feb. 19 to summit@2040health.org or 720.216.0075 x104. This is a chance for local neighborhood residents to voice their opinions on health, health care and health equity.